You can spend your money on all sorts of bizarre gadgets, from Bluetooth-enabled toothbrushes to toasters that print your selfie on your breakfast. But there’s only a handful of tech accessories that we really can’t live without. Luckily, we've found your one-stop solution. Meet Schatzii: our new favorite brand delivering exactly that, except in style. Founded in 2011 in San Francisco, it didn't take that long for Schatzii's expertise to garner worldwide support and dedicated followers. Schatzii combines the latest technologies with nearly a decade of hardware expertise to design and build the solid reliable consumer electronics and mobile tech accessories you need in your life. Although smartphones are maturing to the size of tablets, all the other electronic devices are striving to get smaller. The more compact everything is, the easier it is to carry all your comforts with you. Headphones are still the choicest equipment for good quality, strong audio. 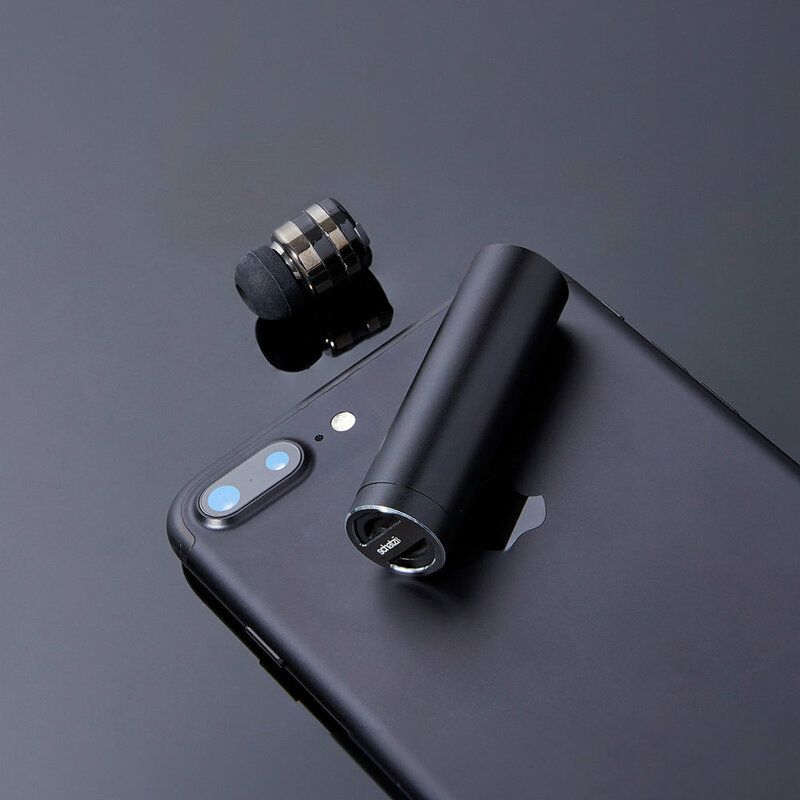 But if you value portability, the smallest Bluetooth headsets are the most convenient devices for call-making and listening to music. Schatzii's BULLET series is leading the charge in the Bluetooth headphone lane. Coming in four different models, these Bullet earbuds are compact, advanced and exhibit complete wireless features. Opting for quality over quantity, Schatzii's state-of-the-art audio design offers crystal clear sound and maximum functionality (no more blowing your headphones out after playing music too loud or too long). Not done yet! We remember a time, not long ago, where the prospect of being able to take a call through headphones that had wires was innovative and cool. Schatzii's Bluetooth BULLET selection takes that to the next level; providing the sleekest and most discreet sound experience you can imagine. Schatzii's selection doesn't stop at headphones, they offer a wide range of beautifully designed accessories. Check out some of our favorites below! The T-BONE is an All-in-One mobile accessory that comes in handy while driving, at home or in the office. The T-BONE delivers convenient 3-in-1 functionality as a Car Charger with 2 USB PORTS + High Capacity Rechargeable Power Bank + LED Torch Flashlight. The Schatzii S1 360° Swivel Mount is a MicroSuction Phone Dock that requires NO Tools, NO Clamps, NO Adhesives, and is easy to install and remove. The patented 360° Swivel Mount is powered by Nanotechnology and utilizes millions of microscopic suction cups that provide a vacuum-like grip for your phone to any flat, smooth, non-porous surface without the need for any tools, adhesives or cumbersome clamps. The Schatzii AIR Ionic Car Air Purifier + Car Charger with 2 USB Ports quickly cleans the air in your car and removes smoke, odors, toxic fumes, dust, pollen and pet dander using it's powerful built-in negative ion generator. The AIR is also a handy car charger with 2 USB Ports for fast charging of your mobile phone and tablet. Schatzii Smart Cloths are expertly created with intelligent function and smart design to keep your screens clean without using any messy sprays or liquids. The Smart Cloths are Antimicrobial-resist mold & mildew, Anti-Static and Anti-Dust, and also Machine Washable and Durable for Long Life. The Schatzii UrbanPro is a water-resistant, ultra lightweight dual-purpose Laptop + Tablet Backpack and Carrier Bag, ergonomically designed for comfort. Made of water-resistant high gloss nylon, this bag will help keep your gear dry when its wet outside. WE THE URBAN Approved! To learn more and cop some of these for yourself, check out www.Schatzii.com and be sure follow their socials below!